More than 300 resident and migrant bird species have been recorded here in Panti Forest Reserve, an Important Bird Area (IBA). 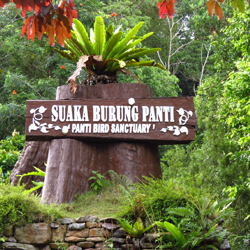 Panti Forest Reserve is located 20km from the nearest town of Kota Tinggi. Please take note that a permit is required to enter this forest reserve. Application for a permit must be done through the state Forestry Department.